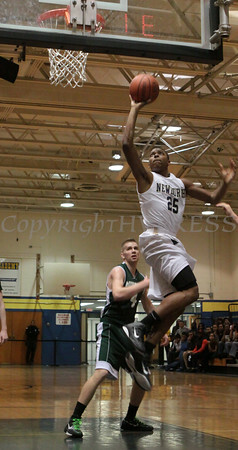 Newburgh Free Academy defeated Minisink 78-34 in a OCIAA, Section 9 game in Newburgh, NY on Thursday, March 3, 2011. Newburgh Free Academy Goldback Xaivier McAllister (25) drives to the basket against Minisink during their Section 9 league game at NFA in Newburgh, New York on Thursday, March 3, 2011. Newburgh defeated Minisink 78-34. Hudson Valley Press/CHUCK STEWART, JR.